the theme of the jam was `10 seconds` and before we had even started development, Feasil had a cracker of an idea. 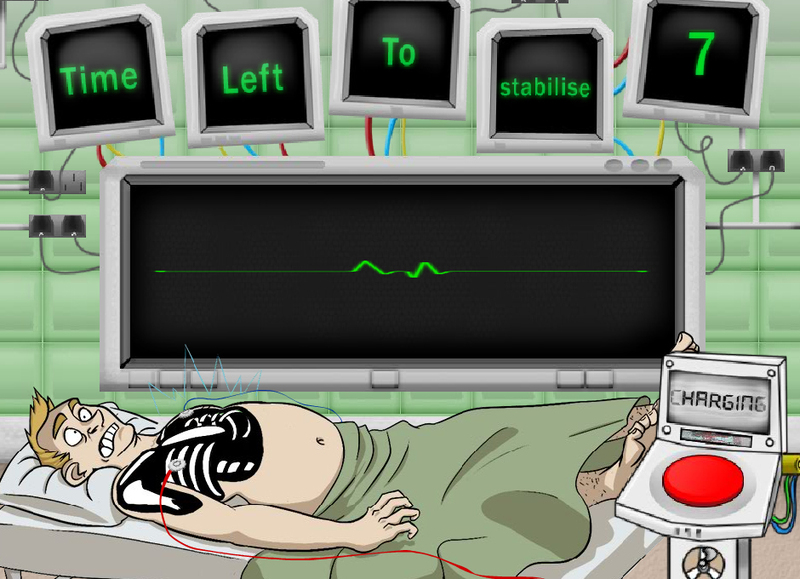 a game based around defibrillation of a dying patient. 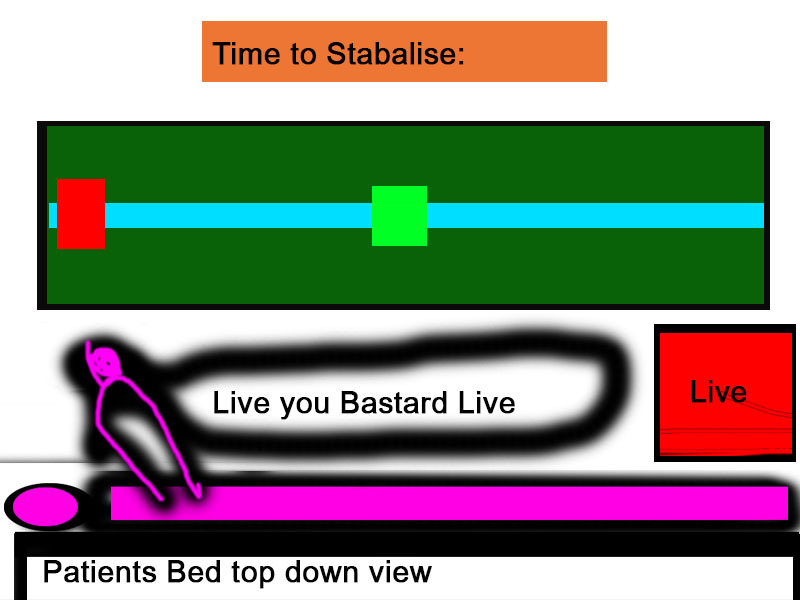 a life or death hospital scenario was perfect for a theme about urgency and a counting down timer. as for the team this time, Fes was on hand to design and program in actionscript 3. I myself handled the bulk of the art & animation and Becca supplied character goodness. here’s a peek at one of the very first `art`assets made, just to show you how far we came in a weekend. all credit goes to faisal. naturally. as for the proper in-game art, I managed to recycle a fairly cool trick from Tixel for the pulse & TV glow. in flash,I would have a blurred duplicate of the light/object in question, and make it pulse between opacity very quickly. and it would give the look of the humming light you see from old TV`s. take a look and see what I mean when you play the game. but as mentioned in the video commentary, I could have done more of this, and made more variants of the pulse to better accommodate gameplay, but I think faisal was afraid to ask me to do more work knowing him lol. I initially tried some variants on a bog standard hospital hallway, a syringe holder and an intestine draped across the sky dripping blood. (see the video) but I was unhappy with it so thankfully becca made the improvement you see above as i went to work on tidying up all the clipboard graphics faisal made and the many,many typos. also easy to spot in the video. and here’s a genuine in-game screenshot, pretty snazzy no? the character art by becca is so clean and exaggerated it suits the games premise very nicely. I kept most environment art line-less and coloured with unattractive tones. 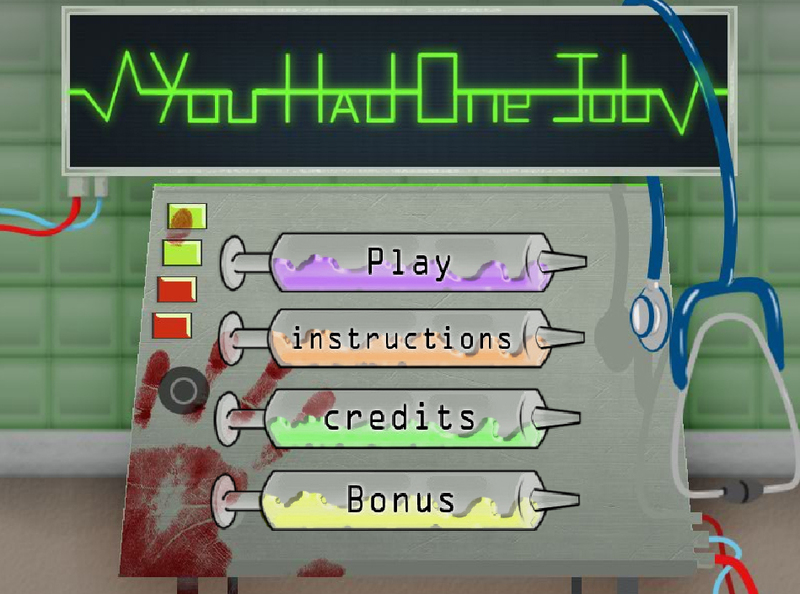 the interactive button in the bottom right is a bit more pronounced because it`s important to gameplay. who could ever get tired of zapping this face for 10 seconds at a time? here’s the submission page for our entry on ludumdare. and the game on newgrounds.